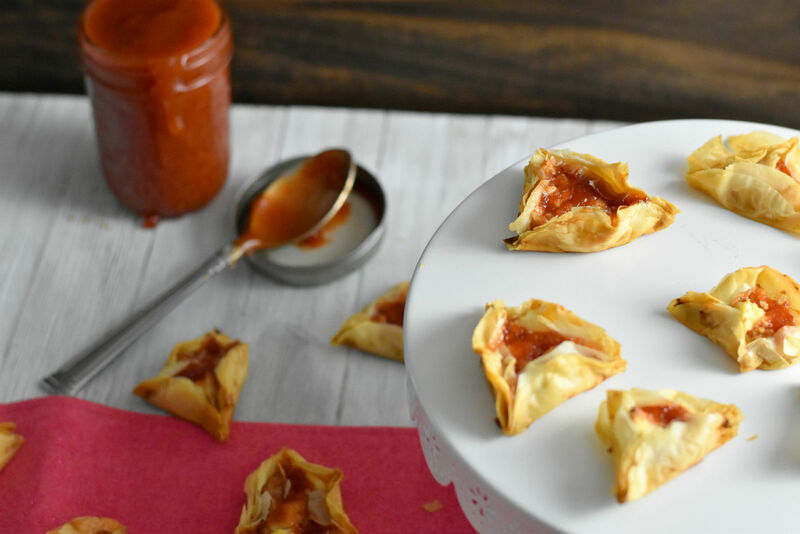 A Latin-inspired treat to celebrate Purim. Guava, or guayaba in Spanish, is native to tropical areas such as Mexico, Central America, South America and the Caribbean. Because of its proximity and availability, this fruit is a part of many Latino cuisines. Guavas have a strong tropical fragrance and floral taste notes similar to papaya and grape. They can be prepared a variety of ways (think smoothies, cocktails, glazed over grilled meats, and even fish! ), but is especially wonderful mixed with cheese, such as queso fresco, because it provides the sweet and salty element that is so irresistible. If you cannot find queso fresco in your area, you can also use a mild feta (try soaking it in water to remove some of the saltiness). Another option is ricotta cheese supplemented with a nice pinch of salt. 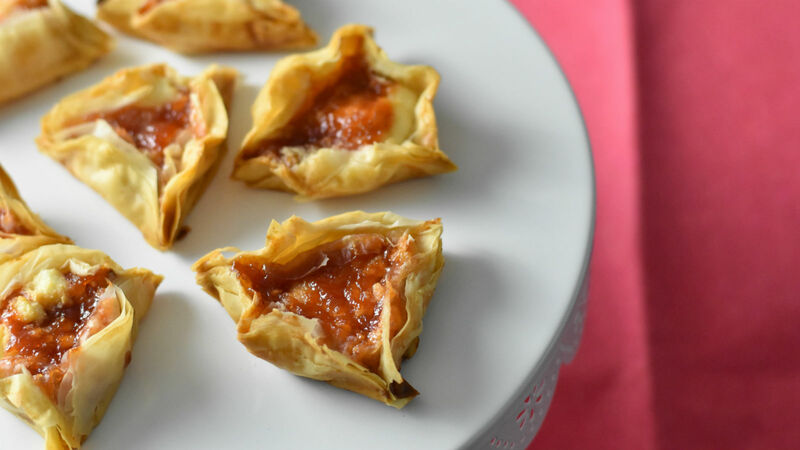 Guavas can be found fresh from early spring through the winter, but in this recipe, I used a guava paste, which can be found year-round and is much easier to work with as the many seeds have been removed. You can find guava paste in the international section of most large supermarkets (I found mine at Shop Rite), and there is even kosher-certified guava paste if that’s important to you. Please note: In this particular recipe, you want to make sure to use paste and not jelly as jelly can ooze out too much. 1 cup (approximately) queso fresco. See note above — you can also use feta cheese or ricotta. In a saucepan over low heat, mix the guava paste and ½ cup water with a whisk until the mixture comes together and there are no lumps. Add the rest of the water if needed. Continue to add water and whisk thoroughly until you achieve the desired consistency. When it is the right consistency it should coat the back of a spoon, like a thick sauce. Set aside and allow to cool. When working with the phyllo dough it’s very important to gently roll it out flat and immediately cover it with a damp towel. This ensures that it doesn’t dry out while you are working with it. Take approximately 3-4 sheets at a time and use a cookie cutter or a cup with a diameter of approximately 2 ½ inches, and make circles as close together as you can (to maximize the amount you can make on one stack of sheets). I recommend scoring the dough around the cutter or cup with the tip of a sharp paring knife. Work quickly to fold the edges of the circles up and pinch on 3 corners to create a triangle. Brush them with generous amount of melted butter to hold the edges together. After you have made all your triangles – fill each one with a little bit of crumbled queso fresco and top with approximately 1-2 teaspoons of the guava “sauce.” Take care not to fill too much, or the guava will melt a bit and ooze out of the triangle. Bake on a sheet pan lined with parchment paper about 15-20 minutes, until golden brown. When the hamantaschen are done, allow them to cool on a rack a few minutes before eating them. Note: They are best enjoyed soon after they come out of the oven, but you can also reheat them in a 350 degree oven for a few minutes until warm and enjoy the next day.